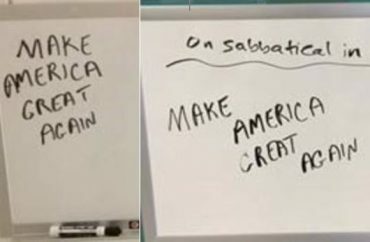 A series of messages left on dry-erase whiteboards at Skidmore College during the spring semester saying “Make America Great Again” were deemed racially motivated attacks, a determination made by the school’s Bias Response Group. The group’s year-end report notes that the term – the tagline of Republican presidential candidate Donald Trump — was written on the whiteboards of two female faculty of color, one of whom has “immigrant parentage.” One message appeared in March and another in April in separate buildings. In April, after the so-called “Chalkening” kicked into high gear nationwide, “multiple faculty door whiteboards” at Skidmore were hit with “Make America Great Again” messages, the report states. This time, a “majority of BRG members do not interpret these messages as political speech but as politicized, racialized, targeted attacks intended to intimidate,” the report adds, indicating some on the group may have dissented. The whiteboard messages were just a few examples among many other complaints lodged with the Bias Response Group at Skidmore College, a private, independent liberal arts college in New York, during the 2015-16 school year. 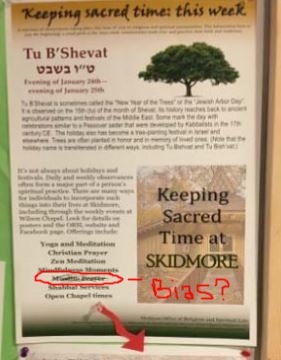 Other complaints to the bias group included the fact that the words “Muslim Prayer” were crossed out with pen on a poster listing campus chapel services. And the Skidmore women’s field hockey team was put through sensitivity training in January over one complaint against it, according to the report. The field hockey team had posted fliers advertising one of their games in humorous ways. 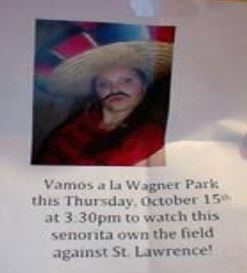 One of the fliers, however, featured “a young woman who appears to be white and the caption reads: ‘Vamos a la Wagner Park … to watch this senorita own the field against St. Lawrence!’ In the photo, the woman is wearing a sombrero, a fake thin mustache, and a t-shirt that reads ‘Maggie’s Landscaping Crew.’” This was considered by Skidmore to be a bias incident. Several legitimate complaints of graffiti and vandalism were lodged as well, including promotional items of Jewish students significantly vandalized throughout the course of the school year, and anti-Christian spray-painted graffiti, which included an inverted cross and a five-pointed star in red paint on a campus wall. College Fix contributor Seth Ian is a YU graduate living in New York City and pursuing his master’s in education.